There have been repeated requests for periodic, high-quality, nonpartisan reporting on the condition and use of groundwater in the United States. In particular, an indicator for the Nation's major aquifers to indicate where water levels are declining, increasing, or stable would be useful. One possible national indicator is a composite water-level hydrograph of each of the Nation's Principal Aquifers based on representative groundwater levels calculated from selected wells. A composite hydrograph provides a broad overview of water levels in a Principal Aquifer. The purpose of the composite hydrographs of the Principal Aquifers of the United States is to show the 'average' response of water levels in the Principal Aquifer over time. This should indicate if there is ongoing depletion, or longer term climatic changes in each Principal Aquifer. 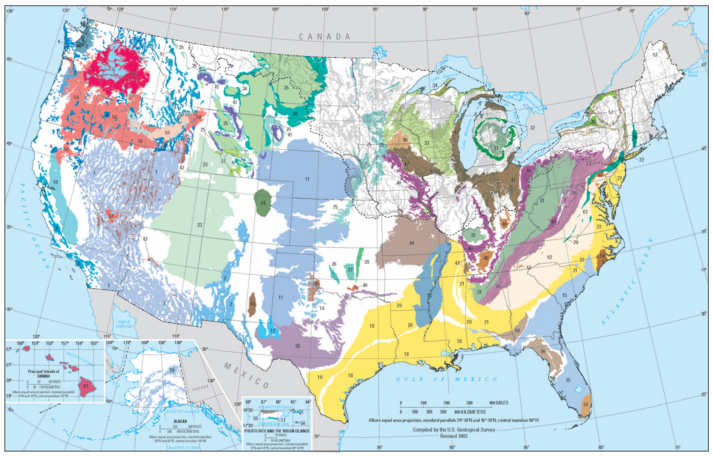 Composite groundwater level hydrographs have been calculated for the Principal Aquifers of the United States, which had enough wells that passed certain criteria (number of wells, length of record). The length of each composite hydrograph is 30 years. Two different composite indices are presented for the Principal Aquifers of the United States. The 'Composite Water-Level Hydrograph' uses the median annual groundwater level for the period of interest for each index well and then the average and median value of all the index wells for the particular year is calculated to determine a composite water level. The composite water levels representing the average or median water level of all the index wells is then presented on a hydrograph. The 'Normalized Composite Water-Level Hydrograph' is based on a calculation of the difference of the median annual groundwater level from the annual average median groundwater level for each well as a percentage of the historical range of median values. The normalized composite water-level hydrograph shows the variation of groundwater levels in the Principal Aquifer around the average value. To view a composite hydrograph, select one of the available Principal Aquifers from the list below. The Composite Water Level page for the Principal Aquifer will present the hydrographs for both the 'Composite Water-Level Hydrograph' and the 'Normalized Composite Water-Level Hydrograph'. The data used to calculate the indices are available through a link on the page. If a Principal Aquifer is not listed, it is not available because it did not have enough wells with a sufficient period of record to calculate a composite hydrograph or the distribution of wells was deemed to be less than optimal.